The Jabberwock recently cooked a Really Big Fish . There was a decent amount of leftover meat – what to do ! I found this recipe on Grant Wilson’s blog, and adapted it a bit. I have never actually tasted or cooked a salmon patty, and I have to say these were DELISH. NOTE: You can substitute grated Parmesan cheese for the flour and corn meal (you may need a little more). I just didn’t have any on hand. Sautee onion, celery, pepper and carrot in a small amount of olive oil. Add to shredded salmon. Add egg, corn meal, and flour (or Parmesan cheese) and mix well. Fry patties in a non stick pan over medium heat until browned on both sides. Leftovers keep very well! Thanks for the shout-out! This adapted recipe looks great. 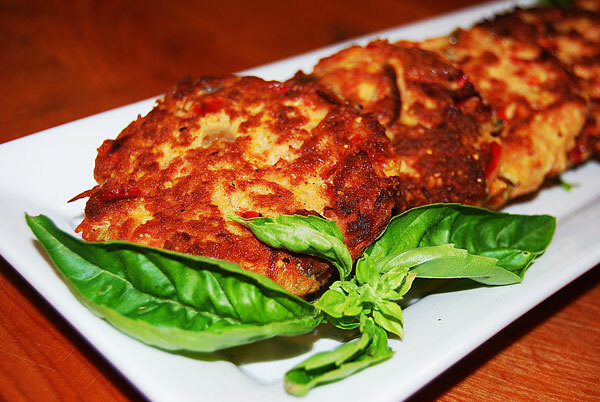 Your are right – patties are delicious use of leftover salmon. These pair really well with purple-hull or blackeyed peas, by the way (another Southern thing). No prob Grant ! Not too shabby for my first ever Salmon patty…..thx for the inspiration.